They are two of British boxing's biggest names and established world champions, but 2017 has been a year to forget for James DeGale and Lee Selby. On Saturday, DeGale, 31, will defend his IBF world super middleweight title against challenger Caleb Truax, his first fight in 11 months after injury, while 30-year-old Selby, the IBF world featherweight champion, will face unbeaten Eduardo Ramirez after an extremely difficult year in and out of the ring. Both fighters have a point to prove and anticipate these contests being the precursor to bigger and better things in 2018. For DeGale, the chance to step back in the ring at all is a welcome one after an enforced lay-off, a consequence of his bruising January draw with Badou Jack. The fight in New York took its toll, with DeGale requiring surgery on his right shoulder, a bridge replaced after his two front teeth were knocked out and also suffering damage to his ear drum. "As soon as I had the operation on my shoulder in June I was straight back into the gym, doing my physio and building my strength up," DeGale said. "I could run after a couple of months following the fight, so my fitness was there, but it was just about getting back, and starting to punch and spar. "The road has been frustrating. I could not lift my arm, and all I could do were slight movements and routines, so it was annoying. But I am in good shape. "My shoulder has healed well. It is nice and strong and I can't wait to box again in London." However, DeGale baulked at suggestions he has been forgotten by the British fans after three years fighting outside his homeland. "A lot of people have called for me to come back here and I don't think I was forgotten when I boxed away," DeGale added. "If anything it made me more exclusive. "It feels good to be back and I can't wait to box in front of my own people and fans who could not afford to watch me fight abroad." 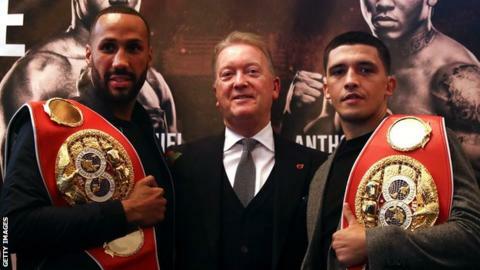 A victory for DeGale will set up potential 2018 fights with Callum Smith, Chris Eubank Jr or even a rematch with rival George Groves, so look for him to impress against Truax. For DeGale's opponent Truax, this fight will be a bonus as he says his aim when he started out as a professional fighter a decade ago was to pay off his student loans - something he has now achieved. The 34-year-old American promised, however, that he was out to do more than just collect a pay cheque, despite having victory odds as long as 28/1 with some bookmakers. "I respect James' abilities, but I am coming here to fight and if I didn't think I was going to win I would not be here," he said. "British boxing fans are some of the best in the world and I am ready to go." For Selby, affectionately known as the 'Welsh Floyd Mayweather', 2017 has been tough in and out of the ring. His dream of a Las Vegas bout was scuppered when Jonathan Victor Barros withdrew from their proposed January fight with the contest eventually taking place in London in July, just days are Selby's mother, Frankie, died unexpectedly. "A better 2018 would be nice but it's part of life," Selby said. "My mum died and then my granddad died a week or two later. They are challenges but you just have to get on with it - 2018 could be my biggest year yet." Selby did the job and then some with an impressive victory over Barros, while he also enjoyed a routine victory in March over Andoni Gago as he looked to keep busy. However, the biggest names, the biggest purses and the top fights continue to be evasive, with Selby's aims of unifying the division no closer to coming to fruition in the past 18 months. That situation will now change, however, with Ramirez' failure to make weight for this fight all but guaranteeing Selby will face rival Josh Warrington in 2018 in defence of his IBF title. That contest is certain to do big numbers at Leeds' Elland Road Stadium and the winner of that fight, which Selby sees as "easy money," will then most likely head to Belfast for a summer showdown with Carl Frampton. For Selby, that means light at the end of the tunnel. "The Warrington fight will be a big fight, he's created some sort of rivalry, he doesn't like me very much, but I'll come through the fight with ease," he told BBC Sport Wales. "So get him sorted and maybe a fight with Frampton towards the end of the summer in Belfast. "And then, if I can beat that pair, hopefully it will be one of the other world champions in America, that would be my ideal 2018 really." BBC boxing correspondent Mike Costello: "James DeGale looks really sharp. I've watched a lot of Truax in the last week and he just looks tailor made for Truax. I think he's walking into an ocean full of trouble." BBC boxing pundit Steve Bunce: "Selby is exactly the same as DeGale, his dance card if he carries on winning... keeps him going two-and-a-bit years. Josh Warrington, the returning Scott Quigg and Carl Frampton are there and that's just on the domestic front. "Featherweight at the moment might just be the best weight in world boxing and British boxing."